Pregnancy Test Still Positive If a Line Is Lighter? If you’re hoping to expand your family, taking a pregnancy test can be a much-anticipated part of your month. Sometimes, though, even the simplest-sounding processes can turn out to hold unexpected complications. You’ve taken the test, and there appears to be a second line, but only barely. Is it possible to be “a little bit pregnant” after all? When you’re expecting, your body produces a hormone called human chorionic gonadotropin (hCG). Some of the excess hCG makes its way out in your urine, which is why you dip or hold the pregnancy test strip in pee to confirm a pregnancy. In the early stages of pregnancy, hCG rises rapidly. Around the time of your missed period, levels usually double every 24-48 hours. There’s a wide range for how many international units per liter (IU/L) is considered “normal”; the more critical part of a healthy pregnancy in those early days is how quickly levels are doubling. Different brands of pregnancy test may require a different minimum level of hCG to show a positive result. Tests tend to work best on the day of your missed period, or even when you’re several days late (again, because the hCG levels double so quickly). One test may show a clear positive, while another only registers a faint line. All of this is to say, generally speaking, any second line counts as a positive for pregnancy. Especially if you’re testing early, a faint line is nothing to worry about. You may even notice that the line gets stronger and clearer if you retest a few days later. You’re using diluted urine. Drinking water in the hour or two before testing can dilute your urine, making it harder for the test to measure hCG. The best strategy is to test first thing after you wake up in the morning. Your progesterone levels may be low. The hormone progesterone helps signal your body that you’ve got a bun in the oven and need to halt normal menstrual cycles. If you’ve been diagnosed with low progesterone levels, have experienced multiple early miscarriages, or are working with a fertility specialist to try to conceive, your doctor may want to be especially vigilant in checking that your progesterone levels are where they should be. In some cases, progesterone supplementation can help you maintain a pregnancy. If you’re seeing multiple faint lines, it’s worth a call to your OBGYN’s office. You may be experiencing a missed miscarriage or “chemical pregnancy.” As many as 20%-25% of pregnancies end naturally in miscarriage, often in very early stages. Often, this is due to chromosomal problems or issues with implantation or embryo development that you have no control over. If the second line on your test is getting progressively fainter, or has disappeared after you saw positive results before, it’s likely you’re experiencing a chemical pregnancy. These days, it’s easier than ever to find a like-minded community of people hoping to conceive. It’s great that more people are talking about previously taboo topics, like miscarriage and infertility. The only problem is that sometimes misinformed opinions spread quickly, leading you to imagine you see a positive result when the test is really negative. 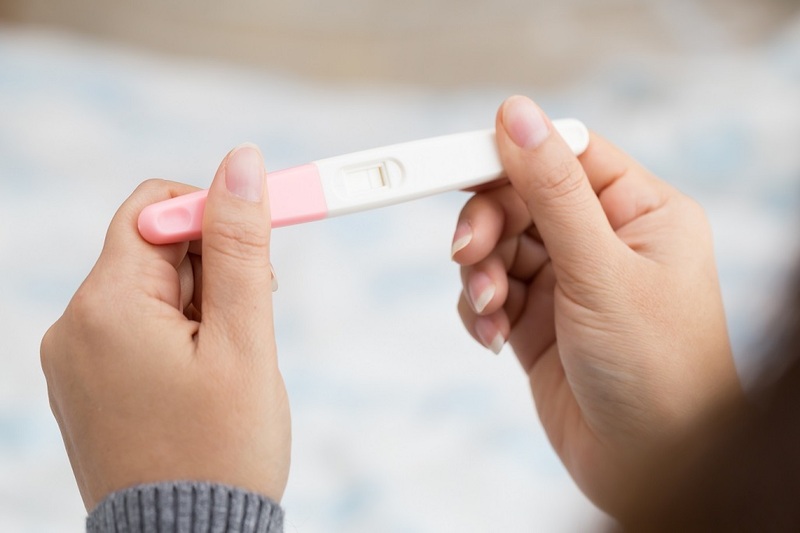 A dark line or a fainter test line still mean a positive result on a pregnancy test. Some expectant moms with higher hCG levels and a sensitive test may notice a very faint line (or VFL in forum acronym-speak) as early as 8 or 9 days after ovulation. Other hopeful members post pictures asking about a VVFL, or a VVVVVFL, or…well, you get the picture. Squinting at a test too long can convince anyone they’ve spotted something. Evaporation lines, or the colorless shadow formed from evaporated urine, can also mistakenly convince some people that the test is positive. It’s better to wait a few days for a clearer result than torment yourself by trying to will a test into being the result you want.